Description: Brown Dun Norwegian Fjord..Broke to ride and drive. Bred for 2011 foal by Lucky. Description: Brown Dun Norwegian Fjord...Broke to ride and drive. Bred for 2011 foal by Lucky. Oda is taller & longer than her sister, Julie.. 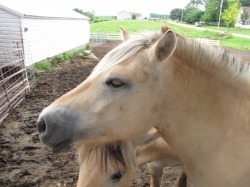 Description: Brown Dun Norwegian Fjord ..Broke to ride and drive Bred for a 2011 foal by Yunior. Description: Norwegian Fjord...in training..Bred for 2011 foal by Lucky..1st mare bred of the season..